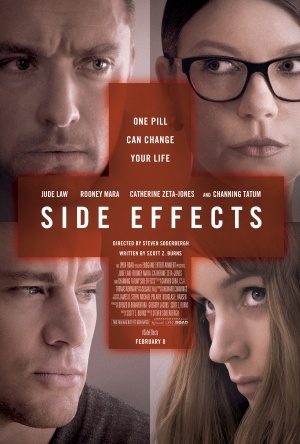 Side Effects was supposedly Stephen Soderbergh’s last ever major film release, but is it a good finale? A woman suffering from depression is put on on a program of medication that sees her emotions spike and irrational thoughts to appear. Her marriage and counselling by her personal doctor become mixed, and everyone must seek out the real from the false. Rooney Mara plays the sombre wife and is excellent at playing a more delicate and emotional character than her break-out role in The Girl with the Dragon Tattoo. The scenes with her doctor are particularly touching as are her isolated moments of difficulty as she appears very emotionally vulnerable. The film then changes almost immediately once the side effects kick in, and this portion of the film transports us to Side Effects now starring the doctor, played by Jude Law. Law plays an intelligent, morally bankable psychiatrist to great effect; his scenes alone and some with Mara prove to be some of the strongest of his career due to an emotional openness and frustration that Law rarely portrays. Soderbergh uses extreme close-ups and a camera focus that continually moves in and out to highlight slow paced intimate moments and images that help convey Mara’s isolated human difficulty under strain. 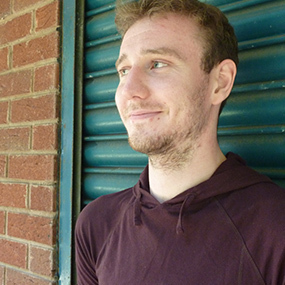 This really helps the viewer connect to the characters and makes the plot much more engaging, especially when small facial expressions and clutches of hands become major insights into a characters mindset during arguments and moments of unease. In recent years Soderbergh has been drawn to corporate conspiracy with films such as The Informant! and Contagion, and for the large part Side Effects is no exception. The film focuses on a woman who is suffering from depression and is prescribed a new medication which has an odd side effect, but uses a serious small scale drama as its base rather than satire or an ensemble’s outlook on events. This is a great change and keeps the pace during the first half with Rooney Mara starring, but the oddness of this and the Jude Law parts becomes apparent when the characters, major themes, and relationships begin to clash and trivialise each other. Despite the first half being the stronger and more engaging segment, the film leaves you feeling cheated out of something which could have been truly special. Regardless, the film is still enjoyable. Even though Side Effects is not structurally-sound, watch it for the sheer master class in direction: the scene lighting, detail and pulling-on-focus come from a master who thinks he’s ready to hang up his directing gloves. I have a feeling he will be back. How did you rate this effort compared to Soderbergh's vast catalogue of films? And do you think he'll be back in the director's chair anytime soon?